^ 华纳兄弟电影盈利数额见Glancy（1995年），4-5页，网上，以及Crafton（1999年），528页。其它电影的情况参见Koszarski（1994年），33页和 David Pierce. Costs and Grosses for the Early Films of Cecil B. DeMille. The Silent Film Bookshelf. Cinemaweb. 1991年 [2007年8月3日]. （原始内容存档于2011年9月27日）. 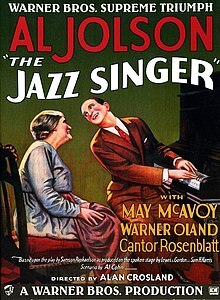 ^ AUDIO: Al Jolson stars as 'The Jazz Singer'—Lux Radio Theatre 1947. Jewish Journal. 2008-07-06 （英语）. ^ 100部最佳电影. 美国电影学会. 1998年 [2007年8月3日].